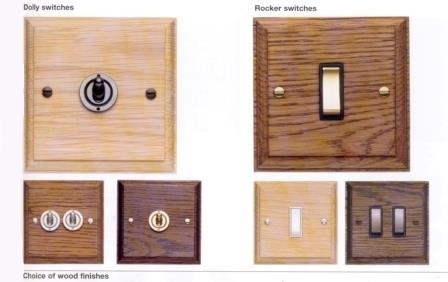 These switches, with their period look & finish would allow it to fit in discreetly to an Arts & Crafts interior scheme, especially if similar wood finishes are being used in the scheme. The LH switches are Dolly switches, the RH ones Rocker switches. 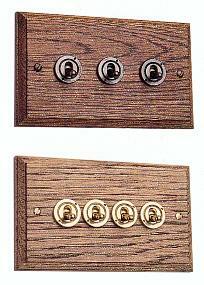 The switches are available as single, double, triple, quad or 6 gang. 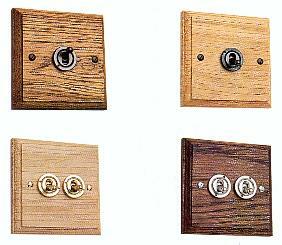 There is a matching range of sockets available as well - see sockets page. Contact us with your requirements for a quote. But please speak to your electrical installer about your exact requirements before we look at doing a quote. 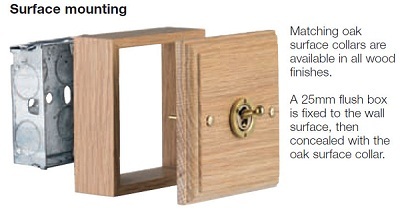 The wood pattress is available in 5 finishes, shown below. 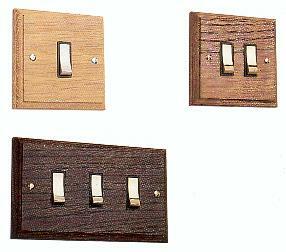 The switch itself is available in white, bright chrome, satin chrome, black, bronze & brass finishes, as shown above. The insert around the switch is available in black as standard, or white (optional). 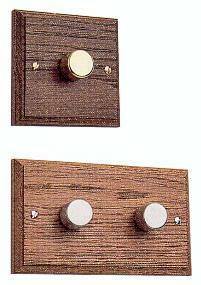 Dimmer switches are also available, in the same combinations above, of number, finishes, button finish, etc. You will need some input from an electrician to help specify these.